The Chart of the Day belongs to Five9 (FIVN). I found the software stock by using Barchart to sort the Russell 3000 Index stocks for the stocks with the highest Weighted Alphas, then again for technical buy signals of 80% or more. 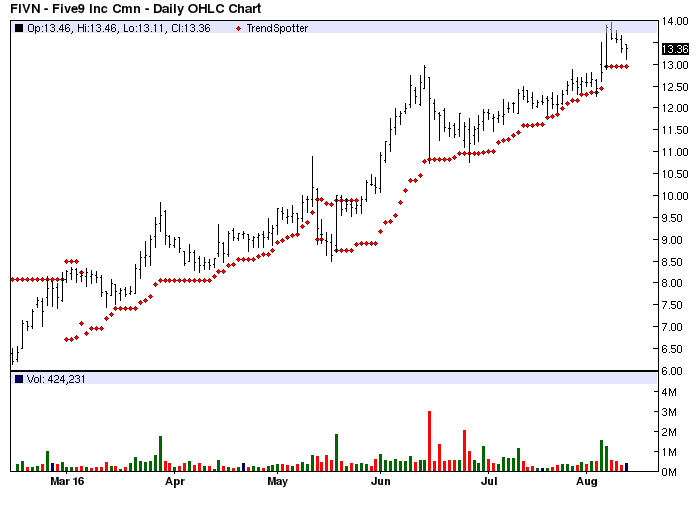 Since the Trend Spotter signaled a buy on 5/25 the stock gained 34.49%. Five9 provides cloud software for contact centers. The Company offers software products such as workforce management, speech recognition, predictive dialer, and voice applications. It offers virtual contact center cloud platform that acts as the hub for interactions between its clients and their customers, enabling contact center operations focused on inbound or outbound customer interactions in a single unified architecture. The Company serves customers in various industries, including banking and financial services, business process outsourcers, consumer, healthcare, and technology. Five9, Inc. is headquartered in San Ramon, California.